L.F.I.S. 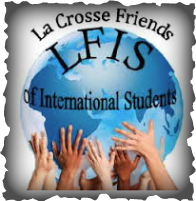 is an organization founded in 1987 to promote social interaction between international students and the La Crosse community. L.F.I.S. is here to help make a transition to the USA fun and interesting. What is the role of L.F.I.S.?  Maintaining a Friendship Family Program.  Providing opportunities for international students to participate in community events.  Supporting activities in cooperation with the International Student Organization. LFIS would like to give you the opportunity of having a Friendship Family. A Friendship Family is a local family (or individual) that is looking forward to getting to know a special student like you. In the past, Friendship Families have invited students to their homes to experience the American lifestyle, to go shopping, sightseeing or to participate in other community activities. LFIS also invites you to participate in special events such as boat trips and welcome dinners. You will meet students from all three universities in La Crosse. You may even meet someone from your own country!